Vancouver, Canada / TheNewswire / November 9, 2018 - Nexus Gold Corp. ("Nexus" or the "Company") (TSX-V: NXS, OTCQB: NXXGF, FSE: N6E) is pleased to report that its wholly owned subsidiary, Nexus Gold Corp. Burkina SARL, has acquired the Dakouli 2 gold concession, a 198-square kilometer gold exploration permit located in central Burkina Faso, approximately 100 kilometers due north of the capital city Ouagadougou. The Dakouli 2 property is located on the Boromo-Goren Greenstone Belt and is bordered to the north by granitic rocks. It is also bisected by the Sabce shear zone, a major structural fault proximal to multiple gold deposits which trends southwest-northeast and bisects the entire long axis of the property. The Sabce is the dominant feature at the 3M+ ounce Bissa deposit, currently being mined by Nordgold approximately 20-kms to the northeast of the Dakouli 2 permit. The Company has identified a large orpaillage situated on the permit's eastern border which is being actively exploited by artisanal miners. The 198-square kilometer property lies immediately south of the Company's 178-sq km Niangouela concession (see figure 1) which has been explored over the past two years. Sampling at Niangouela returned bonanza-grade gold values, including 2,950 grams-per-tonne ("g/t") gold ("Au"), 403 g/t Au, and 49.8 g/t Au (see Company news releases dated January 11 and 24, 2017). The maiden drill program at Niangouela returned significant high-grade intercepts, including 26.69 g/t Au over 4.85m, including 1m of 132 g/t Au (see Company news release dated March 7, 2017). "Dakouli is a promising addition to our portfolio," said Alex Klenman, President & CEO. "Our crew knows the area well as our Niangouela project is adjacent directly to the north of Dakouli and has provided some high-grade results in the past. We feel Dakouli may also present some higher-grade opportunities. The property contains some highly developed artisanal sites, which we believe is indicative of significant mineralization. We are immediately going to start testing these zones and get a good idea of what we're dealing with," continued Mr. Klenman. 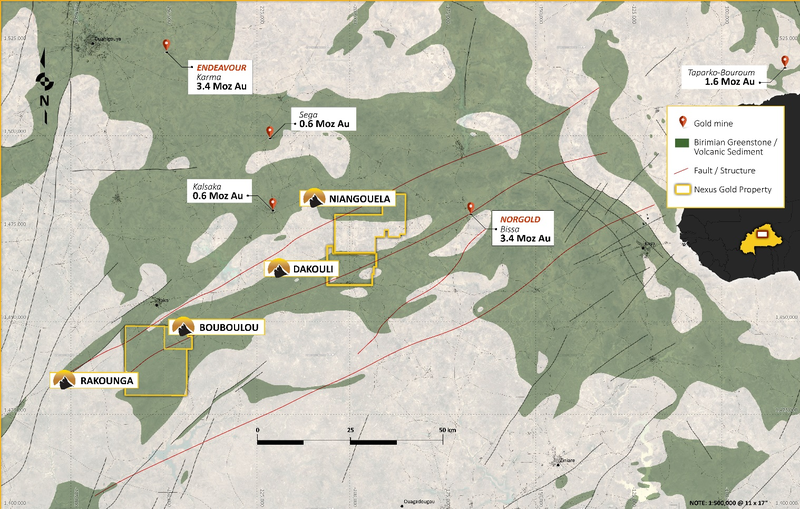 The addition of Dakouli 2 increases the Nexus Gold land holdings in Burkina Faso to over 664-sq kms (66,000+ hectares) or over 256-sq miles of highly prospective ground along proven gold belts. 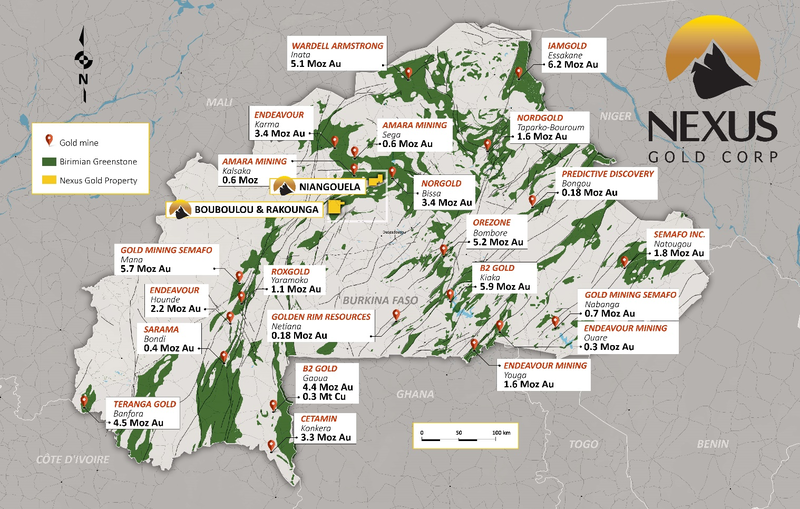 Figure 3: Gold mines/deposits in Burkina Faso, in relation to Nexus Gold project locations. Dakouli 2 is located on the southern boundary of the Niangouela project. 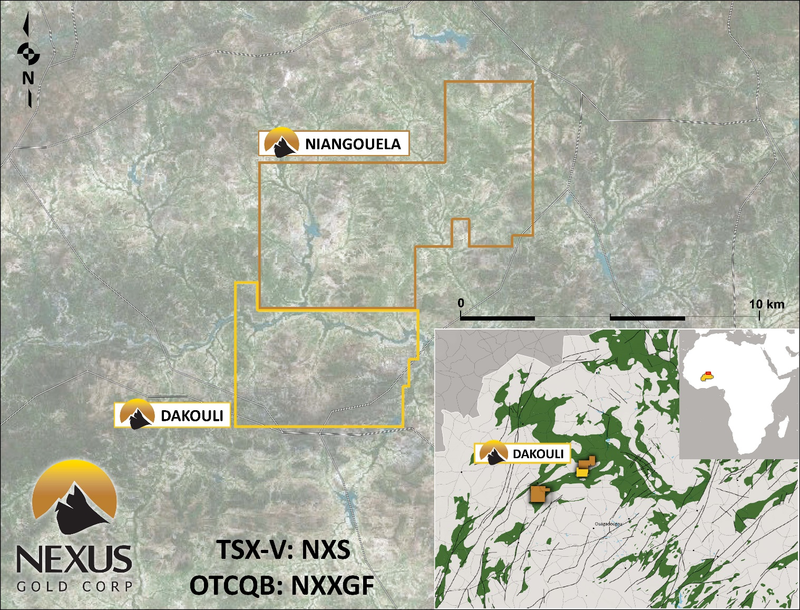 In addition to the newly-acquired 100% owned 198-sq km Dakouli 2 project, Nexus has three other gold projects in Burkina Faso in various stages of exploration development. Bouboulou - The 38-square km Bouboulou project comprises no less than five established gold zones contained within three separate 5km gold trends. Over 60 holes have been drilled to date showing widespread mineralization. Rakounga - The 250-square km Rakounga gold concession is adjacent to and extends the Bouboulou gold trends and currently contains three drill-tested zones of gold mineralization. Over 15-kms of gold trend has been established between the eight known Bouboulou and Rakounga gold zones. Drilling at the Koaltenga zone has produced some lengthy gold intercepts, with several higher-grade intervals. Niangouela - The Niangouela gold concession is a 178-square km project featuring high-grade gold occurring in and around a primary quartz vein and associated shear zone approximately one km in length. The Dakouli 2 project is 198-sq km concession adjacent to Niangouela's southern border. Burkina Faso is home to several multi-million-ounce gold deposits and operating mines, under the control of some of the world's largest gold producers. Nexus Gold is a Vancouver-based gold exploration and development company operating primarily in Burkina Faso, West Africa. The company is currently concentrating its efforts on establishing a compliant resource at one or more of it's four current projects. Warren Robb P.Geo., Vice-President, Exploration, is the designated Qualified Person as defined by National Instrument 43-101 and is responsible for the technical information contained in this release. Neither TSX Venture Exchange nor its Regulation Services Provider (as that term is defined in the policies of the TSX Venture Exchange) accepts responsibility for the adequacy or accuracy of this release. This news release may contain forward-looking statements. These statements are based on current expectations and assumptions that are subject to risks and uncertainties. Actual results could differ materially because of factors discussed in the management discussion and analysis section of our interim and most recent annual financial statement or other reports and filings with the TSX Venture Exchange and applicable Canadian securities regulations. We do not assume any obligation to update any forward-looking statements, except as required by applicable laws.